VANCOUVER, March 26, 2018 /CNW/ – After a successful inaugural year in 2017, Canada’s chocolatier has amped up their fundraising goal for their 2nd annual Clean Water Project. This year, the goal is to raise enough funds to purchase 50 life-changing water filtration devices for their cocoa co-ops in Ivory Coast through the sale of a special chocolate bar. The Clean Water Project, in partnership with the Cocoa Horizons Foundation, funds the purchase of LifeStraw Community water filters and associated hygiene and educational programs for rural communities with limited or no access to clean drinking water. Retailing at $6 each, the 85 g milk chocolate and salted butter toffee bar is available across Canada and online starting March 26, 2018. $2 from every bar purchased helps make safe drinking water a reality for thousands of people (especially children) in cocoa communities throughout Ivory Coast. 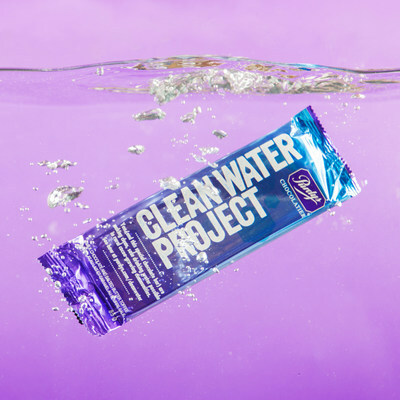 Purdys first launched the Clean Water Project in 2017 with the goal of raising enough funds to purchase 35 filters. After exceeding their initial target, the Purdys team was inspired by the enthusiasm and support shown by customers to increase this year’s goal to 50 filters. Typically, each LifeStraw Community filter can provide clean, safe drinking water for approximately 60 people for 3 years—which means clean water for thousands in need. Purdys uses only 100% sustainable cocoa. Purdys launched their Sustainable Cocoa Program in 2014 to help support their farmer partners, cocoa co-ops and communities in West Africa and South America. By making chocolates using only 100% sustainable cocoa, Purdys directly supports education programs, infrastructure projects, community development initiatives, access to health care for rural communities and many more such initiatives through their partnership with the Cocoa Horizons Foundation. “Thanks to partners such as Purdys, the Cocoa Horizons Foundation is able to drive solutions that address the challenges impacting cocoa communities” said David Imbert, General Manager, Cocoa Horizons Foundation. “Our partners are key to furthering sustainability in the supply chain. It is a journey that needs full participation from the entire industry, to help improve the livelihoods of cocoa farmers, their families and their communities”. Purdys Chocolatier was founded in 1907 in Vancouver by Richard Carmon Purdy. With 80 shops across the country, Purdys is Canada’s go-to destination for innovative chocolate flavours and gifts. Purdys chocolates are made daily at their Vancouver Factory Kitchen, using only the freshest ingredients sourced from around the world. Every creation at Purdys uses 100% sustainable cocoa, ensuring their cocoa farmer partners and co-ops are supported by programs that improve their profits and the livelihoods of their families and communities. Bestsellers include Himalayan Pink Salt Caramels, Hedgehogs, Sweet Georgia Browns and English Toffee. The Cocoa Horizons Foundation is a non-profit organization established by Barry Callebaut in Zurich, Switzerland to scale impact and drive change in cocoa producing origins. It is supervised by the Swiss Federal Foundation Supervisory Authority. The Cocoa Horizons mission is to improve the livelihoods of cocoa farmers and their communities through the promotion of sustainable, entrepreneurial farming, improved productivity and community development. The Foundation is audited annually to verify its activities in Côte d’Ivoire and Ghana, maintain a transparent distribution of funds, and demonstrate compliance with Swiss federal regulations.